米 (mee) = normally this word is rice, but in this context it means tiny pieces. Crispy fried garlic like crispy fried shallot is very common in S E Asia. Chopped garlic is deep fried till golden it is not bitter but has slightly sweet, caramelised and strong garlicy flavour and deliciously crunchy. Only two ingredients are needed, plenty of garlic and cooking oil. Peel garlic and hand chopped till very fine. Be patient with the chopping you will get there after a while. 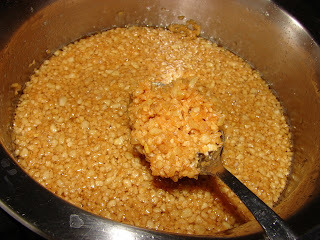 Do not chop garlic with electric blender or food processor, this will easily blend it too fine the resulting fried garlic will stick together into lumps and the fried garlic is chewy rather than getting tiny nuggets of crispy garlic. Put oil in a 8 inch saucepan or wok, heat till moderately hot. Add all the garlic all at once. Keep the heat at medium for about 5 - 10 minutes till the temperature of oil has risen and oil is bubbling nicely but not too rapidly. Keep stirring. After that turn the heat down to medium low and continue stirring and scraping the pan. You should see a good stream of steam rising. If little or no steam the temperature of oil is too low, turn heat up slightly. If the garlic pieces browning rapidly around the edges the heat is too high. At first the the colour is like this. When it becomes lightly brown like this turn the heat down to low. Watch it carefully to avoid overcooking or burning. When cooled the colour will be much deeper and crunchy. 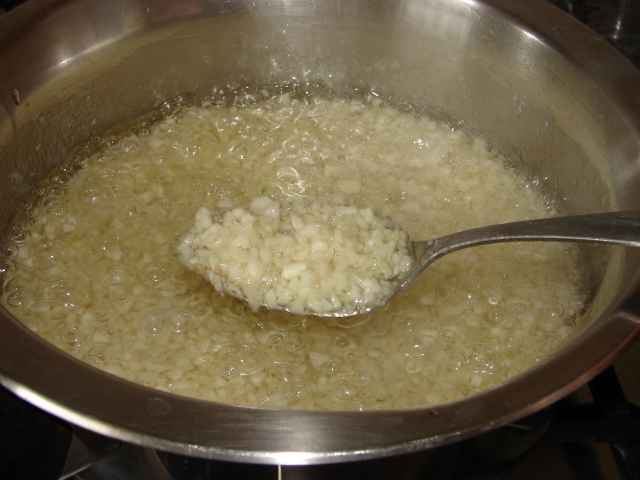 Once cooled if the garlic is not crunchy, return to the stove and heat briefly till oil is hot again. Turn heat off and leave it to cool again. 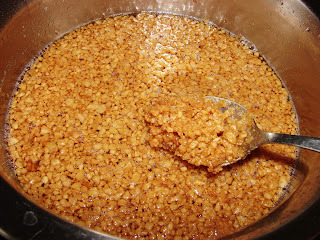 I have converted many of my kwai lo friends who think fried garlic is nasty and bitter. Give this a go if you like garlic. It is seriously additive. 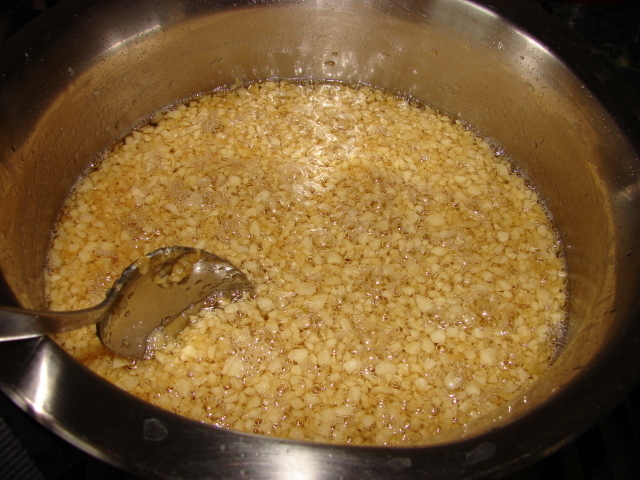 Keep this fried garlic with the oil in glass jar. Will keep at room temperature for about a week or longer in the fridge to remain fresh, flavourful and crunchy. Thanks for the nice visuals. My question is, what is the effect on the much acclaimed health benefits of garlic when we fry it to this extent? PS. At times, I add ginger and chilli to it and it tastes better than garlic alone. Hi As with most deep fried food, I guess some or much of the nutrients will be lost due to the high heat cooking. Think of it as a occasional treat, forget about nutrients forget about the fat, just enjoy it!